Last Friday, the lab decided it needed a “spontaneous act of happy hour” at Briana’s house. She had the comestible well in hand, which left the libation in our hands. 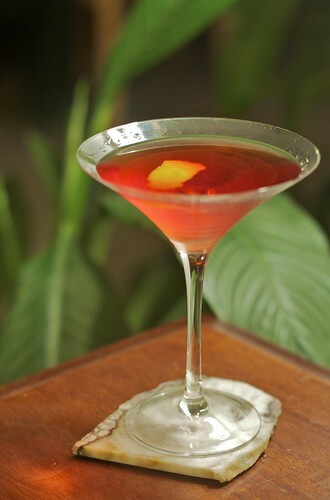 Knowing gin was a popular favorite with all of the revelers, my mind wandered the the Negroni. Tasty, portable and gin based. No problem. Stir in a cocktail shaker with ice and strain into a cocktail glass with a twist of orange. (Alternatively, serve in on the rocks). Anyway you serve it, it makes for a festive happy hour. Addendum, Sept. 4, 2017… After having enjoyed these for many years (more than half a decade since this post), I have come around to the original equal parts recipe. Probably shouldn’t mess with a classic. The Negroni is a great classic cocktail (and, as you mention, drop the gin and add seltzer, and you have an Americano, another classic). The drink is very Italian, very much summer, which means in the winter, it is a great reminder of those summer days. I agree that the Esquire version is better. Adding a little more gin seems to tame the beast that is the negroni. Another version I like is the “Nerina” from Jason Kosmas and Dushan Zaric’s cocktail recipes “Speakeasy”. It measures 1 part Gin (Plymouth, though I prefer New Amsterdam), 1 partPunt e Mes vermouth, and part Meletti Emory, adelightful Italian “digestivo”. Garnish with a twist of orange. I knew about the Americano, but haven’t heard of the Nerina. I’ll have to see if I can find some Meletti. I wonder if Valley Spirits has it (they have a surprising assortment of the very odd) or Corti Bros. Thanks for the heads up.